If you love tools, or have a handy spouse or friend, we'd love to help with your shopping list! Here's a list of favorite gifts for DIYers. We've compiled a list of favorites that might surprise you. Other than the obvious, can you guess what we use these common household items for? Click on the object and we'll tell you why you should add this stuff to your tool box! At K2Workshops, we take pride in delivering customer service. After all, the success of our workshops can only be measured by our students success in their own homes! So like to maintain contact and hear how they've applied their new skills and how their projects are progressing. Activate Your Genius - We have helped hundreds of individuals, leaders, teams, and organizations to find greater satisfaction in their lives and work through our human-centered approach for growth and change. Tamara Creighton, Holistic Nutrition Coach - Holistic Nutrition Coaching can guide you to find the right direction for you based on who you are as a unique individual. I can help you discover what works best for you and give you the tools and hope you need for lasting wellness. Find a 2 or 3 foot length of pipe and slip over the end of your socket wrench. Presto, you're now strong as an ox and can losen even the tightest of bolts. Have you noticed that your door hinges are loose? Have you tried to tighten the screws, only to have them loosen again? Chances are the holes in the doorframe have become too big for the screws. Try this... remove the screws. Grab some white glue and wooden golf tees. Now use something sharp to cut off the tee head. Then coat it with white glue,tap it into the old screw hole, and reinstall the hinge. Toothpicks work too. These should be the cheapies from the dollar store. No fancy wooden handles required! These are great for so many things. We like to use them when spray painting. Just bend the end into a hook shape and hang the item you want to paint. Now you can paint the entire object at once. Hang the skewer from exposed floor joists until your project is dry. A block of wood is a great companion to a hammer. If you need to tap (or bang!) something into place, but don't want to damage it, grab a block of wood. Place the wood on top of whatever you're whacking, but hit the wood instead. This disperses the blow, leaving no hammer marks! Now use it with the claw end to pull long nails. These are just a wonderful weight to do many jobs that you need a scrap of wire for. You can fold them to about any shape and they'll stay put. Try bending the wire into a long "U" shape. Now grab a scrap of cloth and attach it to the end by tying it in a knot. Now you can clean the most unreachable spots. Use it where you might use a bottle brush, only you can shape this to work for many obscure applications. These make wonderful shims. Use them wherever you need to fill space. Stack them as needed and break them off to any length. Do you need to mark a long straight line? Try tying one end to a nail. Now stretch out your string to the length you need and attach a nail to the other end. You can tap the nails into walls, flooring, even out in the yard. Pull the string tight and you'll have a perfectly straight edge to align to. You can attach a $4 line level and now you'll know your line is level. Does the job of a snap line without the chaulk. A cordless drill is such a versatile tool and is a must for every handy person on your list. Use it for drilling holes, but also for driving screws and bolts. We use this drill in our workshops. It’s extremely light weight and does a good job with routine everyday home repairs. Don’t bother to compare this drill to an 18 volt high torque drill. But it has its place and we think this drill is a great value. For a 12 volt Lithium Ion drill, this one’s got some power (250 lb torque). This light weight 2-speed drill comes with 2 batteries, charger and case. This time every year the DeWalt 18v. cordless drill goes on sale for under $100. Occasionally you'll find the 14.4v drill on sale. Both are a great drills with plenty of power. Comes with 2 NiCad batteries, charger, & a ½” chuck. The only drawback to these drills is the weight. The 14.4v drill is a bit lighter at the expense of some power. Our preference is the 14.4v drill, but it is harder to find because Dewalt supplies more 18v drills, making them less expensive. Here’s a nice 18v drill with a light weight Lithium Ion battery and plenty of power (500 lb torque). Comes with 2 batteries, 30 minute charger ½” chuck and 3 year warranty. A variation on your standard combination wrench. This one ratchets, which is a nice convenience. We've tested GearWrench and they hold up to our standards for durability. These wrenches are available in a variety of sets. For better versatility, our recommendation is to select either standard (SAE) or metric, but not a combination of the two. These self adjusting pliers have long been a favorite of K2W, and our workshop students. They are a great alternate to slip-joint pliers because the self adjustment feature lessens user fatigue. We recommend the set of 7" and 10" RoboGrips. These are available from Sears and other home improvement stores. We've done the research for you. These are the tools that we and our students use in our workshops. These tools are selected based on versatility, quality, and price. Do you have a budding auto mechanic on your list? If so, deep sockets are a must. We recommend Craftsmen (from Sears) because their hand tools are guaranteed for life. Select standard (sae) sockets for American made cars and metric sockets for cars made outside the US. Here's a good starter set for both. For metal and wood drilling, you will love these drill bits. The pilot point helps keep the bit from slipping as you begin to drill your hole. If budget allows, the 29 piece set is a dream for anyone who receives this gift. For more help selecting quality hand tools, see our article. Tool boxes are a thing of the past. Professionals and DIYers alike are using toolbags to store and carry their tools. There are many to choose from and hardware and home improvement stores offer plenty of selection. Consider size and durability when picking out a bag. Look for a bag that is big enough to hold a base set of tools, but not everything you own! The more tools you add, the more weight you'll be carrying. Look at the framing and stitching. Will it hold up over time? Our Toolbag is a great way to organize your tools. Store your base set of tools in it so that when you're ready to work on a project, you can just grab it and go. It's affordable, compact and light weight. These are a great and affordable way to turn a 5 gallon bucket into a tool holder. Just attach the organizer to any 5 gallon bucket and you've got many pockets to stash your tools, hardware and supplies. These are available online and in most hardware and home improvement stores. Turn your cordless drill into a cordless screw driver. Just insert the drive guide into the drill chuck and you can change driver tips quickly and easily. These are readily available at the checkout counter of nearly every hardware and home store. This tools lets you choose from (2) phillips heads, (2) slot heads and (2) hex heads. Look for one with a non-slip grip. This clever tool will magnetize the tip of your screwdrivers and other tools. Just pass the tool through the magnetizing side and presto, your tool can pick up dropped screws for you! Pass it through the demagnetizing side and your tool is not longer magnetized. Available at hardware stores and home improvement stores. If you drop a piece of hardware or a tool in a place that you can't reach or see, this tool will help you to retrieve it. The It telescopes out to reach around 2'. Just put the tip near where your part is and it'll grab it. This tool will help you reach a dropped part, but this one has prongs that grab it. This works particularly well for mechanics where a magnetic pickup tool will also stick to engine parts. Do you have someone on your list who is a new home owner? How about a friend or relative who would like to know how to handle simple repairs and emergencies in their home? Give your loved ones the gift of confidence and control over home improvement issues. Understanding how to handle home repairs and emergencies pays off financially for a lifetime. 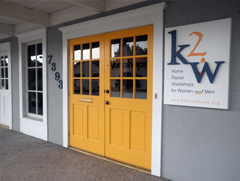 K2Workshops gift cards are available in any amount and can be used for workshops or tools. I took 2 workshops and both have made me more independent and saved me money, more money than the classes cost. I am able to repair and take up and reset a toilet. Nebraska Furniture Mart was going to charge me $55 each and I have 4. The class was easy to understand with a lot of hands on so I got comfortable using the tools and knowing the parts. I was also given information on where you could get supplies. I also took the workshop for small electric jobs. I was able to change several receptacle and light switches and replace the old outside brass lights on the house. Great workshops with hands on and understandable dialog. Attending your Basic Home Repair workshop opened up a whole new world for me. I am one who feels helpless when something needs to be done around the house, and your workshop gave me the tools, knowledge, and most of all, the confidence to tackle minor things in my home and also at my cabin. I would highly recommend your workshops especially to women living alone who might not have anyone handy to make basic repairs and tackle projects. It was worth every penny, and the purchase of your complete toolbox was an excellent investment. Lastly, we also had a lot of fun!!! I took the plumbing and electrical workshops and found both of them very useful. I was extremely fortunate to be the only person in my classes so I received a one on one lesson for each workshop. They made everything very understandable and did great demonstrations. I also really appreciated the hands-on experience as most of my hesitancy in doing plumbing or electrical work is doing it for the first time with someone nearby who could guide me. I would definitely recommend these classes to others. After taking the Basic Home Repair Workshop at K2Workshops in Overland Park, I immediately wanted to put my experience to work. After learning how to put up a shelf, towel bar, replace an outlet with different switches, repair and patch drywall, installing a new light fixture along with basic plumbing, I wanted to go home and practice what I learned. This class really got me excited to take ownership of some small projects at home. I immediately replaced a light switch like we did in class as well as put up a towel bar next to my basement sink. The feeling of "doing-it-yourself" was not only enlightening but empowering as well. K2Workshops made me feel comfortable with the tools, even the power ones! I would highly recommend this class to anyone who wants to take ownership of their house repairs and feel really good about doing it!! This class for me was long overdue. I had always relied on my father to do things for me such as hanging a towel rack or putting in a new light for me. He had always enjoyed doing that for me, but it’s time for me to know how to do it myself. Your class has given me the confidence to be able to even help him out! Now I need for you to have a class on how to weatherproof my house and possibly small remodeling projects. As you know, I would love to remodel my basement, but know there is a lot more to learn. My advice to all girlfriends is to take these classes and BE EMPOWERED. It will give you a confidence that you never knew you had. What a terrific learning experience! Those K2Workshop women really know what they are doing, and know how to teach skills in a way that doesn’t require a manual once you get home. I was so impressed with the facility and the staff that I will definitely be back for more. I will also be keeping the workshop’s gift certificates in mind for the upcoming holidays.